Leading aviation headset manufacturer Sennheiser, the presenting sponsor of iFlightPlanner for iPad, has centralized its aviation-related sales force within the Sennheiser Group to create a single, global sales team. The announcement coincides with new three appointments to the Sennheiser Aviation management team; Mathias Koehler (EMEA Northeast), Mario Jankowski (EMEA Southwest) and Ms. Chris Throndsen (The Americas). Koehler, Jankowski and Throndsen join Singapore-based Maverick Onn, Regional Sales Manager of APAC, Washington, D.C.-based Gus Skalkos, Global Sales Manager C3/ATC and Old Lyme, CT-based David Dunlap, Director of Sennheiser Aviation, to form the Sennheiser Aviation global sales team. The award recognizes excellence in areas of flight proficiency, continuing education and service to the aviation community and will be presented each year at the Sun 'n Fun International Fly-In & Expo in Lakeland, Florida starting in 2014. In addition to a leather, “Instrument Master” flight jacket, the winner will receive a Sennheiser S1 Digital aviation headset. For more information about the IMC Club and the "Brown Jacket" award, visit http://www.IMCClubs.org. iFlightPlanner will be traveling west for next week's AOPA Summit in Palm Springs. If you'll be joining the iFlightPlanner Crew in California, be sure to check out the information supplied by the AOPA for general aviation arrivals and departures at Palm Springs International Airport (KPSP). iFlightPlanner will be with Sennheiser Aviation, our partner and presenting sponsor of iFlightPlanner for iPad, in Booth 610. We look forward to seeing you all there! The iFlightPlanner Crew is excited to announce the addition of iFlightPlanner Premium Business, a multi-user platform designed for charter operators, corporate flight departments and flying organizations with the need to seamlessly share flight and aircraft information amongst their respective pilots, dispatchers, and members. iFlightPlanner Premium Business maximizes the versatility of iFlightPlanner’s web-based flight planning with the mobility and in-flight capabilities of iFlightPlanner for iPad presented by Sennheiser. Pilots whose organizations employ an iFlightPlanner Premium Business account have the ability to view flights and flight details that are created by an associate via wireless data connection between iFlightPlanner.com and iFlightPlanner for iPad. This setup creates a safe and efficient collaborative dispatch environment for any organization, large or small. We continue to rely on member feedback in the development of iFlightPlanner.com and iFlightPlanner for iPad and are seeking multi-pilot organizations interested in the continued development of iFlightPlanner Premium Business. While iFlightPlanner awaits QICP Certification for approved use by charter and corporate flight departments, we encourage organizations who believe they can benefit from these new features to contact us! We are excited to announce the availability of the iFlightPlanner Widget, a simple set of HTML code designed to allow the addition of iFlightPlanner's airport and aviation weather information to any website. Pilots and aviation enthusiasts who are signed in to their iFlightPlanner Free or Premium account gain 1-click access to a complete Airport/Facility Directory, Weather Center and seamless Aviation Charts through any website that hosts the iFlightPlanner Widget. 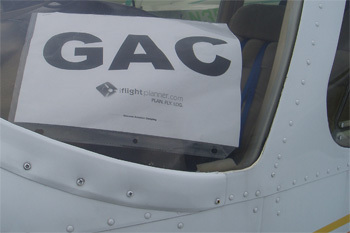 Websites already hosting the Widget include AVweb.com, the Cessna Flyer Association, Piper Flyer Association, the Stuck Mic AvCast and ThePilotReport.com. Visit https://www.iFlightPlanner.com/W to add the iFlightPlanner Widget to your website. Administrators are encouraged to contact us for an Affiliate Code that will enable the Widget to return users to their site when using the Widget’s “Sign In” feature. iFlightPlanner's "Team Aerostar S1" Contest WINNERS! We want to thank all of you who participated in this year's "Team Aerostar S1" contest as part of the festivities at AirVenture 2012! It was great to see you wearing your iFlightPlanner Gear around Wittman Regional Airport, and a special thank you goes to those who participated in the iFlightPlanner Experience survey. The insight you provided is already helping us shape the future of iFlightPlanner! All of our winners, including the two lucky individuals who won the YAK-52TW Experience with The Aerostars and Sennheiser S1 Digital ANR Headset, have been contacted and we are working to coordinate the delivery of everyone's prizes. Keep an eye out for iFlightPlanner on Facebook for photos of our grand prize winners! Thanks again for your support of iFlightPlanner, we're already looking forward to AirVenture 2013 and another exciting week! Have you ever dreamed of flying in tight formation with some of the best pilots in the world or wanted to experience the Quiet Revolution with Sennheiser's S1 Digital ANR headset? As part of the annual festivities in Oshkosh, iFlightPlanner invites you to enter the 2012 "Team Aerostar S1" contest for a chance to make those dreams a reality! Grand Prize winners will be drawn on Sunday, July 29 at the conclusion of AirVenture. Daily winners will be drawn Monday-Saturday at 3pm ahead of the airshows. You do not need to be present to win. There are 5 ways to enter for your chance to win! Simply complete any of the following five tasks to have your name entered to win. Complete all five and you'll receive five additional bonus entries! There's no purchase necessary, and even if you're not making the trip to Oshkosh for the "World's Greatest Aviation Celebration" there are still three ways for you to enter! For each day you vist the booth during Oshkosh you'll earn an additional entry! iFlightPlanner will be with Sennheiser Aviation, our partners and presenting sponsor of iFlightPlanner for iPad, in Booth 288 near Hangar B. We look forward to seeing you all there! The AirVenture 2012 NOTAM specifies sign codes used to inform ground personnel of your desired parking area at Wittman Regional Airport. You'll need to display one of these signs for your arrival and another for departure based on your aircraft type and parking or camping preference. Each one is carrying the logos of Sennheiser Aviation, our partners and presenting sponsor of iFlightPlanner for iPad, Team Aerostar, and iFlightPlanner as part of our "Team Aerostar S1" contest for 2012. Simply print and bring your iFlightPlanner-branded aircraft sign with a valid email address to Booth 288 during AirVenture and be entered to win a number of great prizes! Check out the "Team Aerostar S1" contest details for more ways to enter, and remember to print the signs you'll need for your trip to Oshkosh! We look forward to seeing you there! The iFlightPlanner Shop, Now Open! The exclusive retail outlet for officially-branded iFlightPlanner merchandise, the iFlightPlanner Shop, is now open! We've created a number of unique designs for you to show your support of iFlightPlanner, including some of American Apparel's softest, smoothest, best-looking t-shirts available anywhere! In addition to our embroidered hats and dry performance polos we'll be adding more merchandise as we grow the store, specifically from our partners and manufacturers whose products enhance the iFlightPlanner experience for our members. As part of our "Team Aerostar S1" contest for 2012, every store purchase, including iFlightPlanner Premium memberships and upgrades, will receive one entry to win one of a number of great prizes! Check out all the details of the "Team Aerostar S1" contest and learn how you can enter for a chance to win! Behind the scenes, iFlightPlanner for iPad presented by Sennheiser keeps track of a significant amount of detailed weather data. When you tap the "Update Wx" button on the iFlightPlanner for iPad Account screen, the most recent METARs, TAFs, AIRMETs, SIGMETs and TFRs for the entire U.S. and bordering airports are downloaded from iFlightPlanner.com and stored on the iPad for off-line use. The METARs and TAFs are used to show the current weather for your favorite airports and for airports you view within the A/FD. The METARs are also used to determine the color-coded route corridor weather when you load a flight on the Flights tab and TFRs are depicted on the map of your flight to help you visualize any restricted airspace to avoid. It has come to our attention that downloading updated weather is a bit slow. So, as always, we're working on refining the update process and improving performance! We'll be adding graphical AIRMETs and SIGMETs as well as looking to develop the functionality to update the weather for just your favorites or for an airport you may be viewing within the A/FD. Let us know what you think! We hope this gives you a little more insight into the behind-the-scenes action of iFlightPlanner for iPad! Sun 'n Fun Spring Break Special! Sign up for an iFlightPlanner Free account during Sun 'n Fun and have until April 30, 2012 to upgrade your account to iFlightPlanner Premium for only $69.95! There's absolutely no obligation to upgrade and it's completely FREE to join the thousands of pilots who are already experiencing iFlightPlanner.com, mobile.iFlightPlanner.com, and iFlightPlanner for iPad presented by Sennheiser! Not attending the show? No problem! This offer is available to anyone, even if you're already an iFlightPlanner user. Simply visit iFlightPlanner.com/SUNnFUN to take advantage of this limited time offer! At iFlightPlanner, we consider flight planning to be a process that ultimately enhances the safety and joy of flying, a goal of every pilot when they take to the skies. Planning a flight should therefore be as routine and seamless as possible, allowing us to focus on flying the aircraft while knowing that all necessary information related to the flight is complete and easily accessible. This vision has been an integral part of the iFlightPlanner experience from day one, and every enhancement or feature has been evaluated with those parameters in mind. Our newest addition to the iFlightPlanner product family is no exception, and it brings us one step closer to achieving what we’ve set out to do - offer pilots a fully-integrated flight planning solution that maximizes flexibility and is fun and easy to use. We are proud to announce the imminent release of iFlightPlanner for iPad presented by Sennheiser! iFlightPlanner for iPad is not just another flight planning application for the iPad but instead a logical extension of iFlightPlanner’s proven flight planning experience. Pilots can continue to rely on the convenience of planning their flights on any computer using the web-based flight wizard at iFlightPlanner.com and sync all their flight data into iFlightPlanner for iPad for easy access in the cockpit. This approach not only maximizes flexibility but also takes full advantage of our web-based interface for easy data entry and the native iPad application for increased portability. iFlightPlanner for iPad is, in essence, an interactive cockpit document that gives pilots access to all the relevant routing, weather, and airport information while in flight and eliminating the need for printouts or primary paper charts in the cockpit. Additionally, iFlightPlanner for iPad communicates with the iFlightPlanner servers via WiFi or cellular data connection allowing users to electronically close flight plans while simultaneously creating an entry in their digital log book. All these features, including full access to our entire chart database, extensive weather information and airport/facility directory will be available to anyone with a free iFlightPlanner account. Our premium users will also have the ability create and modify existing flight plans using an optimized version of our intuitive flight planning wizard designed specifically for the iPad. iFlightPlanner for iPad has been developed from the ground up as a result of our strategic partnership with leading headset manufacturer Sennheiser Aviation and will be available as a free download from the Apple App Store. We are in the final stages of development so stay tuned for the latest information! iFlightPlanner.com and the Aerostars formation aerobatic team proudly announce a new partnership that will provide Team Aerostar with integrated flight planning support powered by iFlightPlanner.com and iFlightPlanner for iPad. At AirVenture 2011, iFlightPlanner.com and Sennheiser Aviation introduced an integrated iPad application that maximizes the power and versatility of iFlightPlanner.com’s web-based flight planning wizard with the portability of the Apple iPad. 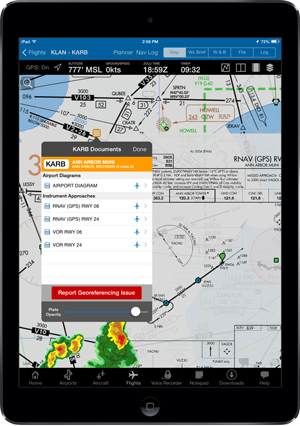 With the release of iFlightPlanner for iPad later this fall, Team Aerostar will have an integrated electronic flight bag that allows for flight details such as their routes, weather, navigation logs, VFR and IFR charts, approach plates, and digital logbooks to be downloaded and viewed on the iPad while in flight and without a data connection. » Click HERE to read the full PRESS RELEASE. It's in the books! Oshkosh 2011. It's hard to believe that another year in Oshkosh for the "World's Greatest Aviation Celebration" has come and gone! We had an incredible week at AirVenture 2011 and want to thank our new friends at Sennheiser Aviation for their unique vision and belief in a partnership that all of us as members of the aviation community can be very exiced about! Pilots will be able to experience an all-new way of flight planning with the release of iFlightPlanner for iPad presented by Sennheiser this fall. There are only 50 weeks left until we make the trip back to Oshkosh for AirVenture 2012 and we hope you will make the trip along with us! Thank you for your continued support in helping make iFlightPlanner.com the premier flight planning resource on the web! ...and soon to be on the iPad! iFlightPlanner.com is proud to announce a strategic partnership with leading headset manufacturer Sennheiser Aviation. As a direct result of this partnership, iFlightPlanner.com will be developing iFlightPlanner for iPad presented by Sennheiser. iFlightPlanner for iPad, scheduled for release this fall but available for demonstration at Oshkosh AirVenture 2011, will seamlessly download flights planned using the iFlightPlanner.com Flight Wizard into the iPad for use in the cockpit. "We are thrilled about the opportunity to work with Sennheiser and provide a flight planning experience that is unmatched in general aviation" said Andy Matthews, iFlightPlanner.com's co-founder and Director of Business Development. "Seeing the results when two like-minded companies from different sectors of the aviation industry come together on a project like this is very exciting!" 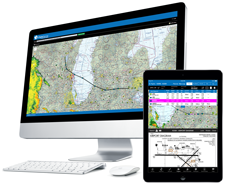 "Our cooperation with iFlightPlanner.com is another example of how we continue to support the broader aviation community," commented Dave Dunlap, director, Sennheiser Aviation. "iFlightPlanner.com is an innovative company with a clear focus on high quality. Through long-term strategic partnerships like this, we want to decrease barriers to flight and make the flight planning process as seamless as possible." 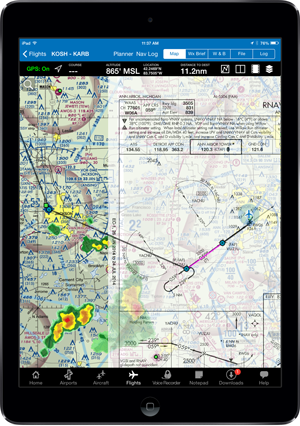 Pilots will have the ability to view flight details, including navigation logs, VFR and IFR charts, as well as approach plates on the iPad while in flight and without a data connection. Attendees at EAA’s AirVenture 2011 will be the first to see the iFlightPlanner.com app in action before its release later this fall. Sennheiser will be hosting the iFlightPlanner.com crew in Booth #288 alongside the newly unveiled Sennheiser S1 Digital aviation headset. To read the full press release from iFlightPlanner.com click HERE, or HERE to read the release from Sennheiser Aviation. Listen to Podapalooza LIVE on LiveATC.net! Tune in at 7:00pm EDT to hear some of aviation's top podcasters talk flying and all things Oshkosh! Podapalooza 2011 will broadcast LIVE via LiveATC.net from the Sennheiser Pavillion just outsite Hangar B.
iFlightPlanner is excited to be along for the ride and show pilots just how easy it is to PLAN. FLY. LOG. with the new iFlightPlanner for iPad presented by Sennheiser. The live feed, which is all being powered by Sennheiser professional audio equipment, can be accessed on LiveATC.net or through the LiveATC apps for iPhone or Android devices.